A rendering of the planned McMullen Museum of Art. 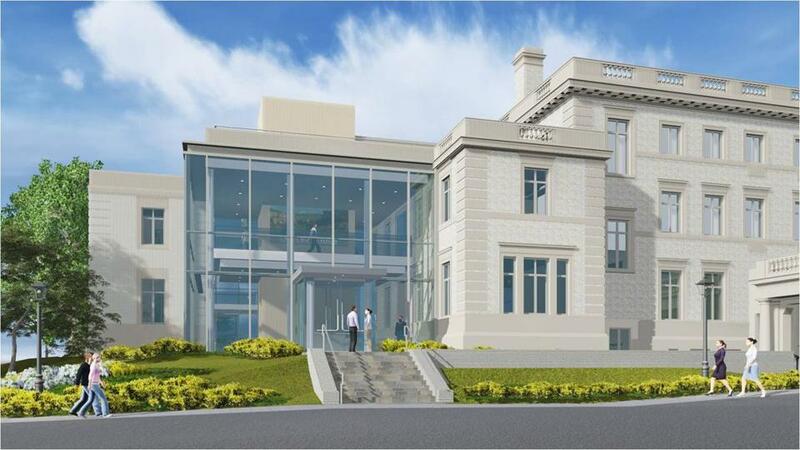 Boston College announced Thursday that it will relocate the McMullen Museum of Art to the former residence of the Catholic archbishop on the school’s Brighton campus. The change will allow the museum to nearly double its exhibition space when the move is completed in 2016, college officials said. The new facility will span 26,000 square feet. The museum, founded in 1993, has been housed in Devlin Hall on BC’s Chestnut Hill campus for the past 21 years, but has outgrown its space. Its future home is just across Commonwealth Avenue, on a site acquired by the college from the Archdiocese of Boston in two transactions between 2004 and 2007, said Jack Dunn, the BC spokesman. The archdiocese sold the campus to settle obligations in the clergy sexual abuse scandal. The college has been using the first floor of the building as conference space. Cardinal Bernard F. Law was the last archbishop to live in the Renaissance Revival mansion, built in 1927. The $25 million project is being funded by a lead gift from the McMullen Family Foundation, which did not disclose the amount of its contribution. “Our hopes are for a university museum that focuses on new scholarly research and on educating the next generation of museum-goers and curators,” Jacqueline McMullen said. McMullen and her late husband, John, were the key donors in the museum’s founding. John was a former college trustee and former owner of the New Jersey Devils and Houston Astros. Renovations to the museum’s future home at 2101 Commonwealth Ave. will include a new atrium and loading dock and a raised gallery roof. All internal walls on the second and third floors will be knocked down and replaced by 4-foot-high moveable partitions, the college said. The museum hopes to preserve the historic building’s exterior — the new atrium will be the only renovation made outside the building. The museum, which attracts 10,000 to 15,000 visitors annually, has long been a key piece of campus life and BC’s character, said Nancy Netzer, director of the museum and a professor of art history. Since the 1990s, the museum has held more than 60 major loan exhibitions, several of which “rival those of anywhere in the world,” she said. Retrospectives have highlighted the works of such artists as Edvard Munch, Paul Klee, Georges Rouault, Gustave Courbet, and Wifredo Lam. The added space will allow the museum to hold more than one exhibition at a time or to expand the current kind of exhibitions it holds with “enhanced design and presentation,” Netzer said. The museum will remain open in Devlin Hall until the renovations are completed. Kiera Blessing can be reached at kiera.blessing@globe.com.